The Dikeou Collection invites Almighty & Insane Books Founder Brandon Johnson, DJ Brett Starr, and DJ/Producer/Designer Steve Berumen, to Dikeou Pop-Up: Colfax (312 E Colfax Ave) for a discussion on house music, moderated by Dikeou Collection Director Hayley Richardson. The conversation will explore house’s origins in Chicago as documented in the book Beyond Heaven: Chicago House Party Flyers from 1983-1989, and look at the genre’s far reaching influence – including the city of Denver. A Chicago house inspired set by local favorite DJ Brett Starr will follow. This event is free and open to the public, refreshments will be served. 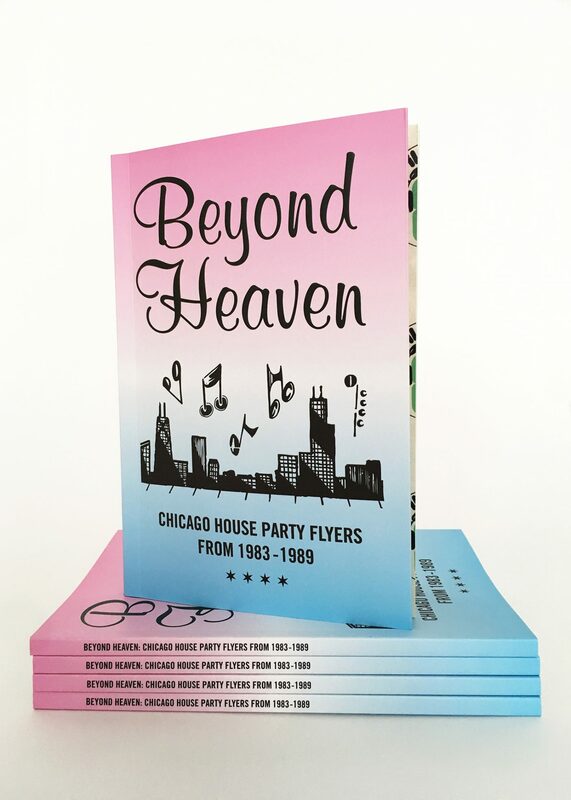 Released in September by Almighty & Insane Books, Beyond Heaven: Chicago House Party Flyers from 1983-1989 catalogs a collection of flyers and other house music related ephemera, courtesy of Mario “Liv It Up” Luna. These flyers, also called “pluggers,” were used for promotional purposes. They would be placed in record stores and passed out at schools and on the street to help get the word out about upcoming house music events. Although by no means encyclopedic, this collection documents a variety of figures from Chicago’s emerging house scene: first generation “kings of house” alongside the WBMX Hot Mix 5 and other lesser-known DJs at a variety of venues. Also included in the mix are promoters, record stores, labels, and an assortment of party crews and dance groups who contributed to the growth and atmosphere of house music in Chicago. This book offers a taste of what many consider to be the best times of their lives, and for others acts as a gateway to one of greatest eras in the history of Chicago music. For more info: www.almightyandinsanebooks.com. Brandon Johnson is Founder/Publisher of Almighty & Insane Books and Managing Editor of zingmagazine. His other publications include Thee Almighty & Insane: Chicago Gang Business Cards from the 1970s & 1980s and Far From the Madding Crowd: Perspectives on the Life & Work of Dan Asher. Originating in Chicagoland, Brandon lives and works in New York City. Brett Starr has been a DJ for 20 years, spanning deep and jazzy, funky, soulful and tech sounds of house music and downtempo. He has performed with iconic legends such as Jesse Saunders, Marshall Jefferson, Doc Martin, Jeno, Miss Honey Dijon, Justin Long, Diz, Jimpster, Johnny Fiasco, DJ Heather, Alexander East, Wally Callerio, Maya Jane Coles, Fred Everything, JT Donaldson . . . the list goes on and on. Brett’s original productions can be found on Dutchie Music, Radda Records, Aspect Audio and more. He’s remixed and been remixed by Johnny Fiasco, Demarkus Lewis and Mikey V. just to name a few. Starr has kept residencies since he began, between the West coast and Denver at venues such as 1015 Folsom, Milk Bar, The Black Box and many more. Steve Berumen (a.k.a. Steve Synfull) is a DJ, producer, promotor, and designer from Denver, CO. Steve first got behind the decks in 1997 and his productions have been played by some of today’s top house DJs. He is the founder of HOUSE GUEST, a monthly underground house night in Denver featuring national & international DJs/producers. He is also Director of Design & Branding at SoCo Nightlife District. Hayley Richardson is the Director of the Dikeou Collection and received her MA in Art History and Museum Studies from the University of Denver. Her curated project, “A Strange Dream,” featuring work by artist Harry Smith, appears in zingmagazine issue 24. Other publication and exhibition contributions include Nothing Belongs to Us (Rule Gallery, Denver), Changing Landscapes: Themes in 19th-Century French and American Painting (University of Denver Victoria H. Myhren Gallery), Warhol in Colorado (University of Denver Victoria H. Myhren Gallery), Blink! Light, Sound, and the Moving Image (Denver Art Museum), and “Alternative Space” (Albuquerque Weekly Alibi).